Benalmadena is one of the most picturesque destinations on the Andalusian Costa del Sol. With a sunny and mild climate all year round, quite typical of the region, its beaches and parks seduce the summer visitors for a relaxing holiday. Benalmadena has three main areas: Benalmadena costa (the coast), Arroyo de la Miel and Benalmadena village, each one of them particularly attractive. Benalmadena is the ideal destination to practice all kinds of sports. Here we’ll find Puerto Marina, the biggest marina on the Costa del Sol. The tourists will also discover the ideal infrastructures to play golf, as the municipality hosts over 30 golf courses; tennis courts and an endless range of areas to go trekking or cycling in an enchanting natural environment. 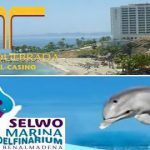 The leisure offer is completed with a casino, museums, the Sea-Life and Selwo Marina aquariums, Tivoli World amusement park and plenty of bars and restaurants to have a great time. Furthermore, it’s very near other top class tourist destinations such as Malaga, Marbella and Puerto Banus. There are a wide range of hotels in Benalmadena to suit all tastes and budgets, in any of the three areas.